– Hello, Pepito! Are you in jail again? Too bad! Why? –Yes, Fr. forgive me! I was out for four months. However, I did not find work anywhere, I did not have support from anyone; you know my family chaos. Temptation was stronger, and I failed again. 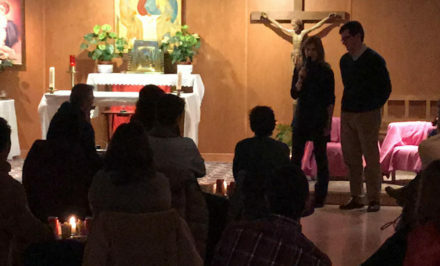 Almost two years ago when we became aware that the Blessed Mother wanted to send us to such an existential periphery like a jail for teens, we launched into the adventure – with many questions and doubts, but also with great confidence and daring. 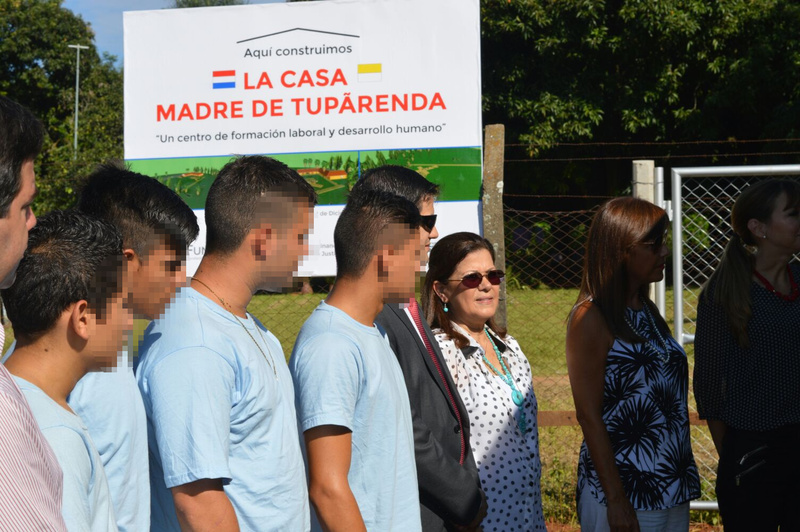 We found youths most of whom come from very difficult surroundings: dysfunctional families, poverty and misery, violence, abandonment, abuse, and with consequences that are even more difficult such as living on the street, falling into drug addiction, delinquency, etc. However we also discovered that many of them, in the same jail seek change in their lives. 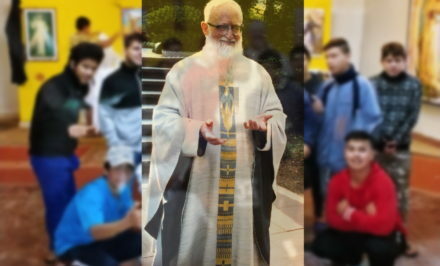 With some of our motivation, or of so many other goodhearted people, they resume – or they begin school, they begin to struggle against their vices, they participate in some training course, and they take steps of spiritual growth such as Baptism or First Communion. When their desired moment of obtaining their freedom arrives, they leave with great illusion and hope. Nevertheless we sorrowfully discovered that many “Pepitos” return to jail a short time after their release because: they cannot fulfill their alternative means, recidivism, lack of work, or a return to drugs… But at the root, many times it was because of not finding real support “outside” to continue their process of change. 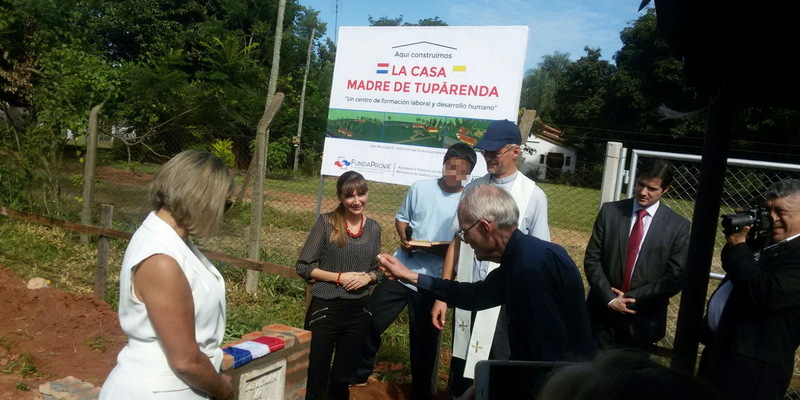 The dream: Could it be that the Blessed Mother wanted to have a house in Tupãrenda, where she could embrace and educate them for this new life? 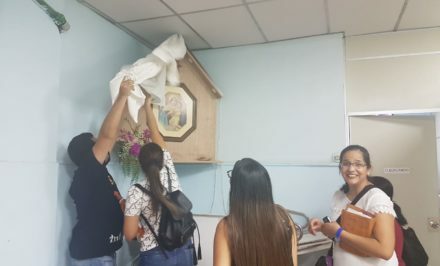 Along with the Prison Ministry team, we began to question this reality, and we began to dream: We are accompanying the teens very close inside the jail, but what can we do to continue to accompany then where they are released? 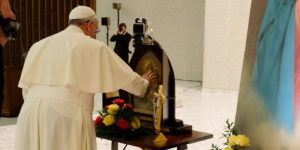 Could it be that the Blessed Mother wants to use us to offer them the support that they need for a more dignified life, with studies, training, work, etc.? 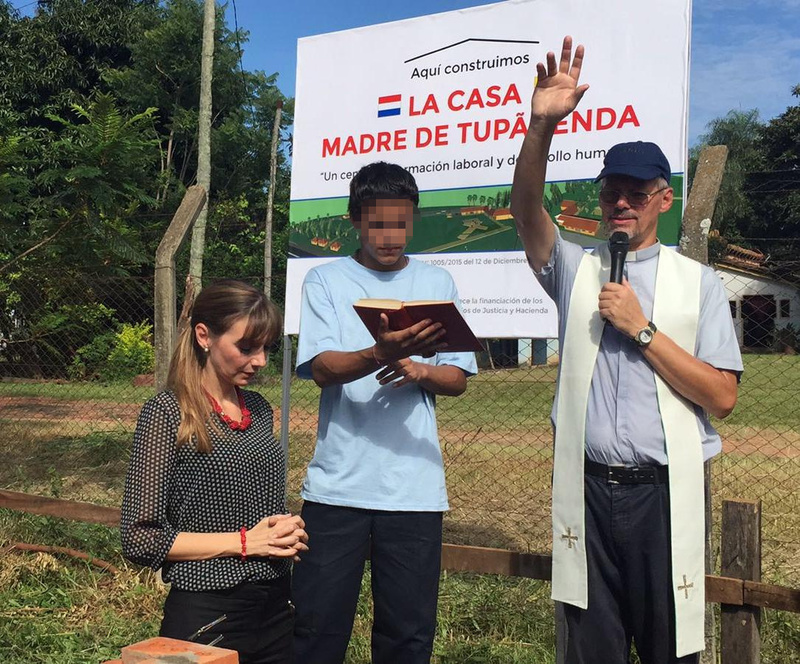 Could it be that the Blessed wanted to have a house in Tupãrenda, where she could embrace and educate them for this new life? Could it be that there are “Pepitos” who will break the vicious cycle of a lack of opportunities, street, drugs, crime and jail? A dream! But not so utopian! 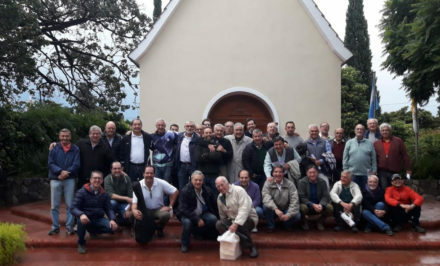 I learned about prison ministries in the Dominican Republic and Chile that have developed very effective models of social reintegration of teens in conflict with the law. They offered us their know how and support, and they encouraged us to make this dream a reality. Something fundamental was in discovering that within the Ministry of Justice there was a team of very committed people with the same desire to improve offenders’ situations, to avoid recidivism and the possibility of real social reintegration – something essential to diminish juvenile delinquency. We joined forces, dialogued, projected, prayed and every time God and the Blessed Mother opened more doors. 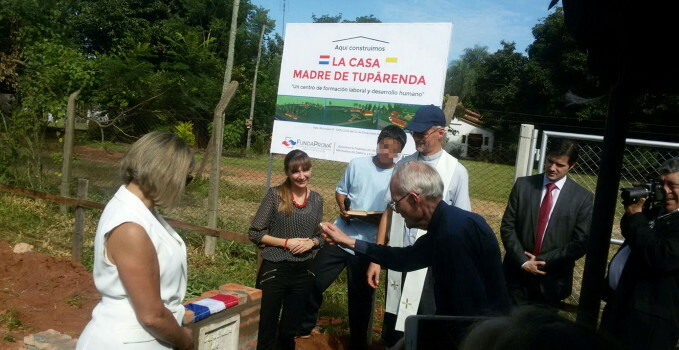 The “gave us” a Foundation – “Fundaprova”, land in Tupãrenda, and many generous people who gave and give time, money and strength in providing for this dream. 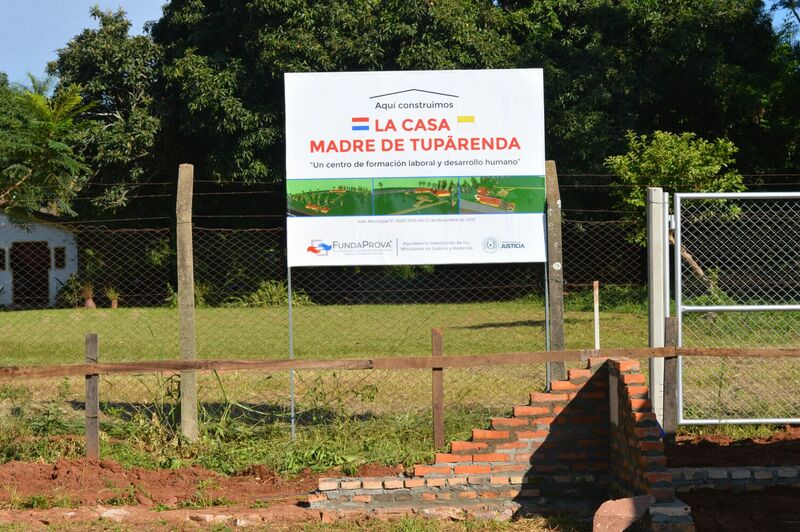 The former Minister of Justice, Sheila Abed, and her Vice-Minister, the current Minister Carla Bacigalupo, gave their all and believed in our project to the point of contributing funds for the construction and for the functioning of “Casa Madre de Tupãrenda”. The Sinafocal of the Ministry of Work allocated six free training courses: masonry, plumbing, electricity, household repairs, organic gardening and of two for master builder with tools, materials, an official title with the possibility of more courses in the future. After many bureaucratic and political comings and goings, the last obstacles were overcome in the middle of January. 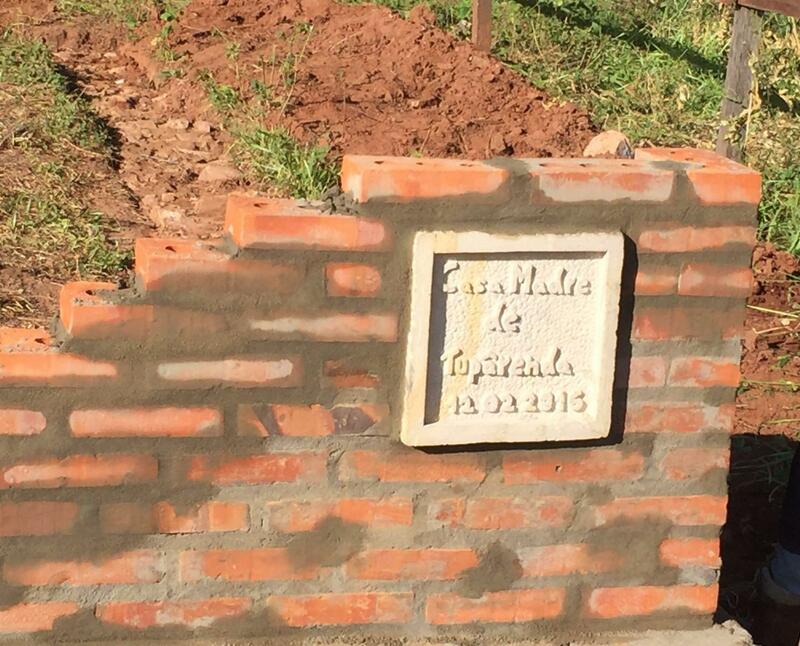 We could start the much-awaited construction with the blessing of the cornerstone, on Friday, 12 February. 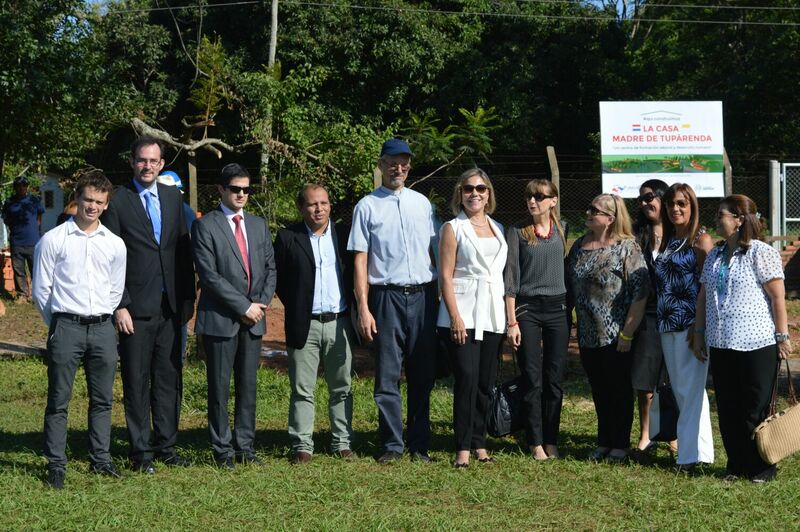 The two Ministers and other authorities from the Ministry of Justice attended, as well as Sinafocal from the City of Itauguá, the Ministry of Industry…There were many members of the prison ministry and of Fundaprova. Most of all, there were many future benefactors– incarcerated teens that had the privilege of participating in this beautiful ceremony due to good behavior. We count on all of you! With your prayers and capital of grace, and with whatever each one wants and can contribute…May God and the Blessed Mother reward you abundantly!